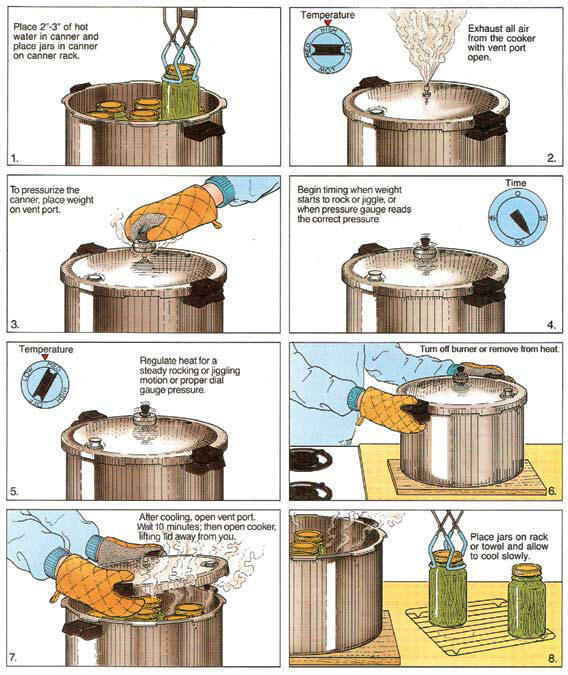 These directions for using your pressure canner may serve as a guide and a reminder to the basic steps in home pressure canning food; how to set-up and use your pressure canner, but you should refer to the more specific directions that came with your pressure canner. If you lost the manual, see this page for free replacement manuals which you can download and print. 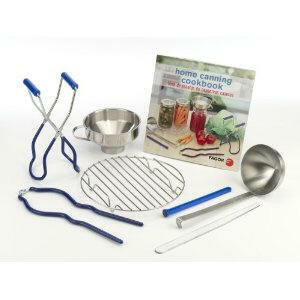 Also see this page for many recipes and directions to make many foods to pressure can! If you are looking to possibly purchase a pressure canner, see this page for our recommendations, prices and where to buy them. Check the jars for nicks, cracks, and sharp edges. Check the rings (screw bands) for dents or rust. 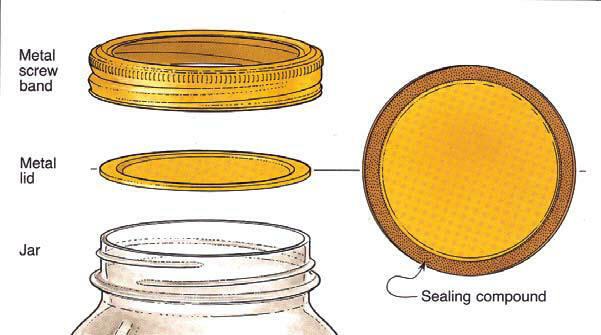 Use only jars, lids, and bands in perfect condition so an airtight seal may be obtained. Wash and rinse jars, lids, and bands. Pour hot water into jars and set aside until needed. The jars and lids don't need to be sterile, just clean and warm (to prevent breakage from thermal shock). The canner will sanitize both the contents and the jars! Put the canner on your stove, centering on the burner. If you have a glass or ceramic stove, be sure that the canner does not overextend the burner by more than 1 inch, and check the stove's manual to be sure the use of a pressure canner is ok. See this page for more information about canning on glass and ceramic stoves. The amount of water to put in the canner depends upon the canner, so always refer to the directions that came with your canner. The 23 quart Presto directions call for "3 quarts of boiling water, canning rack, and jars in canner. To prevent water stains on jars, add 2 tablespoons white vinegar to water in canner. Always use the canning rack that came with the canner. Jars may break if set directly on bottom of canner. In general, 3 inches of hot water into the canner. Too much water is unlikely to cause harm, but too little could boil dry and that would be a major problem. To prevent water stains on jars, add 2 tablespoons white vinegar to water in canner. Always use canning rack. Jars may break if set directly on bottom of canner. Start the canner heating up by turning the burner on to a low setting to warm the water. Take care not to set it too high and boil off the water or reduce the level, while you are filling the jars. Select fresh firm food. Sort food according to size. Clean food thoroughly. Prepare according to recipe. Fill hot canning jars promptly with food and liquid to recommended level. 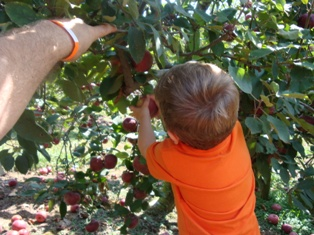 Allow 1/2-inch headspace for fruits. ALL vegetables and meats require 1-inch headspace due to expansion during processing. Work out air bubbles with a clean nonmetallic spatula. Wipe sealing edge clean with a damp cloth. Adjust bands according to closure manufacturer's directions. Look through the vent pipe to be certain it is open before placing cover on canner. To clean the vent pipe, draw a pipe cleaner or small brush through the opening. For Presto brand canners, align the V mark on the cover with the V mark on the body handle and lock securely by turning in the direction indicated to close (clockwise). Cover handles must be centered over body handles. Do not force beyond this position. Vent (exhaust) air from the canner and jars by adjusting the burner's heat to a relatively high setting to create a steady flow of steam from the vent pipe. Consult the instruction book which accompanied your range for recommended heat setting. Reduce heat to maintain a moderate steam flow. Allow steam to flow for 10 minutes to fill the canner with steam and remove air. Place the pressure regulator [the regulator weight] on the vent pipe. Set the burner at a relatively high heat setting, on most range burners, and heat the canner until the pressure dial gauge registers desired pressure. The processing time begins when pressure gauge reaches the correct pressure. Adjust heat to maintain correct pressure on the dial gauge. That may take a few tweaks! For canners without dial gauges, start timing when the weighted gauge begins to jiggle or rock. One type of weighted gauge should jiggle 2 or 3 times per minute, while another type should rock slowly throughout the process - check the manufacturer's directions. Loss of pressure at any time can result in under processing, or unsafe food. At end of processing time, turn burner to "OFF" and remove canner from heat source. Lift pressure canner to remove it from burner. Sliding cookware can leave scratches on stovetops. Let pressure drop of its own accord, do not quick-cool. Do not run water over the canner! Pressure is completely reduced when the air vent/cover lock and overpressure plug have dropped and no steam escapes when the pressure regulator is tilted. Do not use the pressure dial gauge as an indicator for when pressure is completely reduced. Attempting to speed the cooling of the canner may cause jar breakage. Standard size heavy-walled canners require about 30 minutes when loaded with pints and 45 minutes when loaded with quarts. Newer thin-walled canners, like the Presto models, cool more rapidly and are equipped with vent locks that are designed to open when the pressure is gone. These canners are depressurized when the piston in the vent lock drops to a normal position. Often you can hear a click when it drops. When the pressure has been completely reduced, remove pressure regulator from vent pipe and let canner cool for 10 minutes. Do not remove the pressure regulator until pressure is completely reduced and the air vent/cover lock has dropped. Always remove pressure regulator before opening the cover. Open the canner. Note: take care when opening a hot canner! Lift the canner cover toward you to keep steam away from you when opening. For Presto canners, to remove the cover, turn counterclockwise until cover hits stop. Cover handles will be beyond the body handles. If cover seems to stick or is hard to turn, do not force it open. Sticking may indicate that there is still pressure inside the canner. If in doubt about pressure being completely reduced, let the canner stand until cool before removing the cover. When jars are cold, test seal, remove bands, wipe jars, label, date, and store in a cool, dry place. Most canner foods will taste good for about a year. Technically, they are safe for years past this, as long as they remained sealed, stored properly and show no signs of spoilage. But after a year or two the quality and taste will appreciably decline. 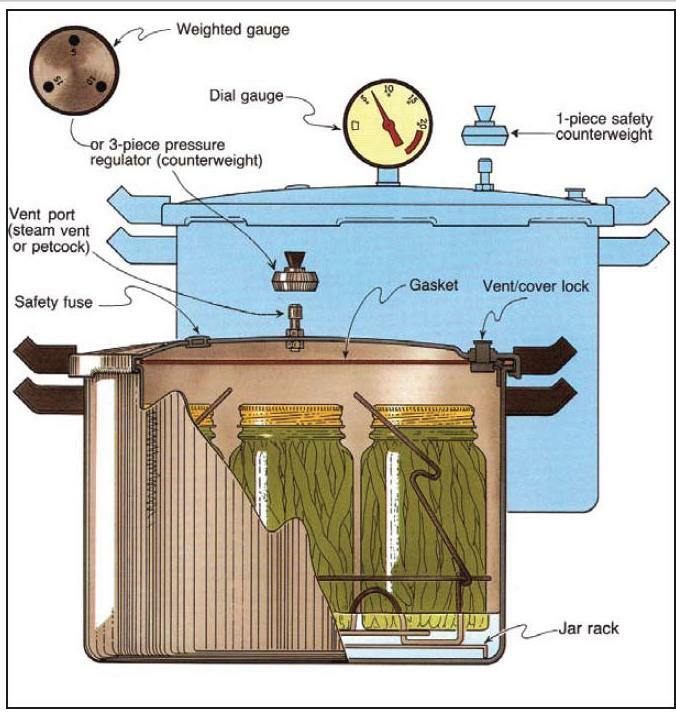 Failure to vent trapped air - When you seal the canner, it has water, jars and air (O2, N2, CO2, etc.) in it. The air trapped in a pressure canner has different thermodynamic properties than steam (H2O) and lowers the temperature, which results in under processing. For this reason, we vent pressure canners for 10 minutes before the weights are put on and they are pressurized. Dial gauge malfunctions - Dial gauges should be checked for accuracy each year before use. If the gauge reads high or low by more than one pound at 5, 10 or 15 pounds pressure, replace it. Weighted gauges are always accurate. If your canner has both gauge and weight, also go by the weight using the gauge as a guide only. This is usually about $79. (which is a GREAT price for a pressure canner). There is also a 16 quart version for about $69. Click on the links at left or above for more info and current pricing.